Dear sweet little old Mrs. Wilberforce is looking for a lodger. 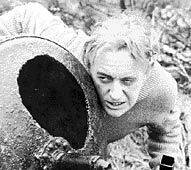 The creepy, shifty-eyed Professor (Alec Guinness) is looking for a hide-out  I mean, for lodgings. Bring the two together, and youve got the set-up for one of Ealing Studios most charming comedies. Mrs. W., of course, cant see that theres anything suspicious about her new lodger, or for that matter his unsavory associates, who convene nightly in the Professors digs on the pretext of practicing their string quintet playing. But while a record player fills the house with the strains of their musical subterfuge, the Professors gang plots a heist which, with Mrs. W. as an unwitting accomplice, looks like quite the perfect crime  and is, till you-know-who finally cottons on, and the gangsters unenthusiastically find themselves embarking on a dear sweet little old rub-out . . . With Peter Sellers and Herbert Lom among those on hand in support, Guinness here gives an uncharacteristically splashy, animatedly zany performance as the evil mastermind. Hes lots of fun to watch, and the films a joy from start to (very clever) finish. The last of the comedies produced by the Ealing Studios, and one of the finest, with a supremely dark tone which makes a climactic series of murders as hilarious as they are grotesque. THE LADYKILLERS pits an implacably dotty landlady (Katie Johnson) against a criminal gang which includes Alec Guinness, as a "mastermind" with hideous teeth; Cecil Parker, as a bumbling military type; Herbert Lom, as an American-style gangster; Peter Sellers, as an inept teddy boy; and Danny Green, as a kind-hearted thug. The gang are using Johnson's house as a base from which to plan an elaborate robbery, but their combined talents evaporate in the face of their landlady's blithe command of her own, idiosyncratic world. In one scene, they are forced to halt their attempted getaway in order to take tea with Johnson and her friends and join in a sing-song around the harmonium! 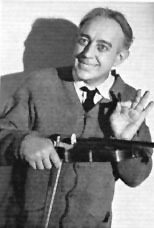 THE LADYKILLERS was the last comedy produced by Ealing, which was in the process of closing down at the time of the film's release in 1955. Johnson, who was to die two years later, won a British Film Academy Award for her role. Shortly after the film's completion, director Mackendrick left England for the US, where he scored another triumph with SWEET SMELL OF SUCCESS.